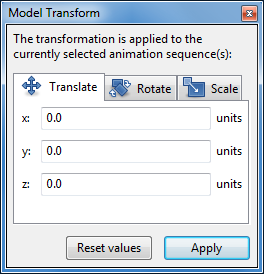 The Model Transform dialog is used to translate, rotate or scale the entire model. or the “Transform” button in the application toolbar. Contrary to the Joint Inspector, the Model Transform dialog can not be used to transform individual joints in a skeleton, a feature that is only useful for static, non-animated models. The virtue of the Model Transform dialog is that it affects the entire model (the whole skeleton), and that the transformation is applied to all currently selected animation sequences. If no animation sequence is selected at all, the default pose (also called the “bind pose”) is transformed. An authoring program might have exported a model in a scale or default orientation that does not agree well with the Cafu coordinate system, or just is different from other models that you already have. Use the Model Transform dialog to fix such and similar cases easily.